Fahrenheit is a temperatur scale based on ane proposed in 1724 bi the Pols-born German pheesicist Daniel Gabriel Fahrenheit (1686–1736), efter whom the scale is named. 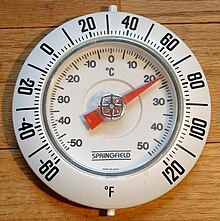 It uises the degree Fahrenheit (symbol °F) as the unit. There exist several accoonts o hou he oreeginally defined his scale. The lawer definin pynt, 0 °F, wis established as the temperatur o a solution o brine made frae equal pairts o ice an saut. Further leemits war established as the meltin pynt o ice (32 °F) an his best estimate o the average human bouk temperatur (96 °F, aboot 2.5 °F less than modren measurements). The scale is nou usually defined bi twa fixed points: the temperatur at which watter freezes intae ice is defined as 32 °F, an the bilin pynt o watter is defined tae be 212 °F, a 180 °F separation, as defined at sea level an staundart atmospheric pressur. ↑ Robert T. Balmer (2010). Modern Engineering Thermodynamics. Academic Press. p. 9. ISBN 978-0-12-374996-3. Retrieved 17 July 2011. This page wis last eeditit on 1 Apryle 2017, at 12:56.